The amount of data that a business needs to filter, search & evaluate for qualifying leads is humongous. Managing this data in excel sheets can be tedious. When this data is managed by various employees, across different industries, regions, for different products/services, a good tool is a must. A CRM system can help you to filter the right data for your products/services. The actions related to the business contacts, leads and companies can be managed more efficiently using these tools. If your team is finding it hard to manage their sales data, it is time to look for an optimal solution. The CRM system not only organises information, but also presents it in contextual sense for relevant personnel to take action. The key is organising data to maximise Sales opportunities in a given time frame. The customer acquisition roadmap is the most critical aspect for business growth. Choosing the right market, industries, and client profiles is the key to Sales. Most organisations face challenges in finding their best customer acquisition strategy due to lack of structured data. The CRM system allows you to analyse all the data for your contacts, associated leads & business opportunities. It also stores historical information of your customers. This knowledge is important in coming up with the best customer acquisition roadmap. The strategy is based on data points like average time to make a sale, industry segmentation, market segmentation, fastest selling products/services and cross selling opportunities. The CRM system analyses all this data to help organisations to come up with most effective customer acquisition plans. When your sales team is growing, keeping track of their leads becomes tedious. All sales representatives need to deal with huge amounts of data. To manage sales teams, one needs to look into their sales quota, contacts, activities, action plans and much more. All this can be done through a CRM system. It organises most important data for the managers. The managers can get alerts & notifications for key business events. For e.g. if a quotation needs to be sent to an important client, then proactive messages are sent by the system to the relevant person as well as their managers. The CRM system also tracks the performance of individuals, their sales meetings, quotas, conversions and revenue generated for the company. Your company has many different products & services. It has various salesmen marketing them in different markets & industries. Analysing the profitability of the products/services is very important for overall growth. The time it takes to sell a product, the cost to service the client complaints, how easy it is to recover payments from clients in different markets, all these aspects play a major role in overall profitability of a company. A CRM system is resourced with the right information to analyse this data. The CRM system can help a company to find its most profitable products, markets & growth opportunities based on this data. 5. Analysing sales figures is hard due to lack of realtime information : Sales metrics are very important for analysing how the company is performing. Lack of realtime systems and data make it hard to evaluate things. The data can help companies to discover issues proactively. For e.g. 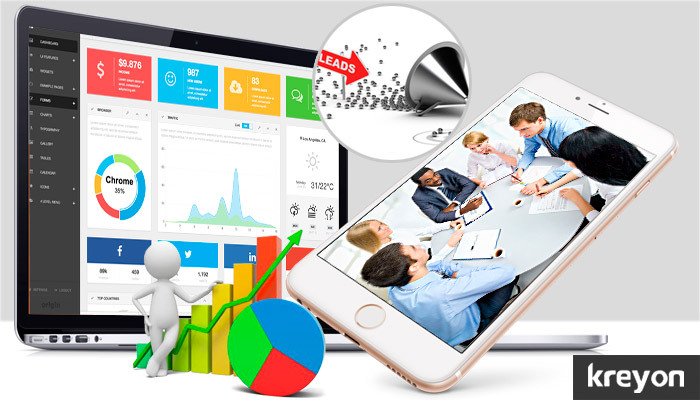 CRM system can effectively track the average time to make a sale. Analyse with realtime data on how leads are moving, where they are getting stuck & send automatic notifications to key personnel for resolving bottlenecks. A CRM System is equipped to analyse key sales metrics like revenue generated per day, sales projections, sales quotas, average time for a sale etc. A good CRM system also creates workflows to drive sales efficiency to improve revenues and growth for the company. A sale is getting increasingly tougher due to surging levels of competition. Companies are looking at ways to sell more efficiently. A CRM System organises data, makes sales more efficient and empowers companies with growth levers. The CRM system is an indispensable tool in the digital world, where every piece of information is crucial to solve the sales puzzle.